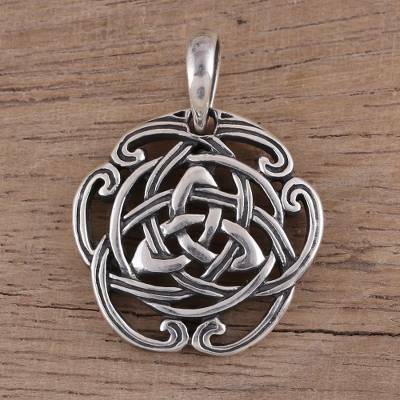 Celtic Knot Sterling Silver Pendant from India Artisan, "Celtic Reverie"
Designed by Neetu Barathi in India, this pendant recalls Celtic knot motifs from ancient times. The pendant is crafted by hand from sterling silver with oxidized channels that make the design stand out beautifully. I absolutely love this piece. It is so beautifully made. Beautifully made, nice quality with enough weight to keep in place though not heavy. A small curve to keep if right side-showing. I have enjoyed all pieces from Novica...this being one of my favorites!